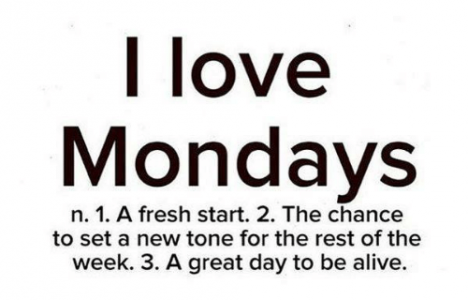 QUOTE OF THE DAY: Mondays are for fresh starts! THOUGHT FOR THE DAY: I really like Mondays. Monday is a fresh start to the week. Monday is another chance to get the week right. I just like the feel of starting over on Monday. It’s like a restart of your focus, of your goals, and of your everything. After Saturday and Sunday off you get to go at it again. That two days off helps Monday feel fresh and new again. You don’t need a new year’s resolution to set a new goal. All you need is a Monday. I hope you have a really great Monday and you can knock out some great work at your job this week. I hope that in your relationship goals with your friends and family and significant other you can find more love more understanding and hope. 1) My Monday begins with gratitude and joy. 2) I choose to have an awesome week. 3) Each new day brings new possibilities, experiences and opportunities. THOUGHT FOR THE DAY: Let’s live this day as if everything was a miracle. The human body is a miracle. The way our eyes see color is a miracle. The fact that we have life and exist today is a miracle. The sounds we hear with our ears are a miracle and the delicious food we can taste with our mouths is a miracle. Every breath is a miracle. A hug is a miracle. Human touch is a miracle. I could go on but you get the idea right? Every day’s a gift just take it as it comes. You got air up in your lungs. Be grateful rain or sun. So, on this amazing Monday, on this cherished gift of a Monday, let’s be kind to others. Let’s see the miracles all around us every day. I know life is a mix of good and bad and sometimes ugly. Let’s choose to see the good in life. And acknowledge the other stuff too. Today is another amazing opportunity to change someone else’s life. Today is a great day to lead others into the life you want to live by example. Life is so short. Let’s find time to meditate, to exercise, to take care of ourselves and our bodies and keep sharing the love to other people. Let’s be the way-showers and the love-givers in this world. Monday let’s do this day with joy! The richest place on earth…. THOUGHT FOR THE DAY: I was creating this audio message here and this quote came to mind. I think it was because I am thinking about launching a fun and new exciting idea. If you died today, what dreams, what ideas, what gifts, what talents, what voice, what stories would die with you? 1) Every moment of my life is amazing. 2) Absolute determination and motivation will help me reach my goals. 3) Today is the best day of my life.